"41AN13 - 12" by Timothy K. Perttula and Robert Z. Selden Jr.
DECORATION (INCLUDING MOTIF AND ELEMENTS WHEN APPARENT): The rim panel is defined by a single horizontal engraved line immediately above the vessel carination. On the panel are five negative ovals defined by a series of eight vertical to arcing engraved lines. Poynor Engraved, var. 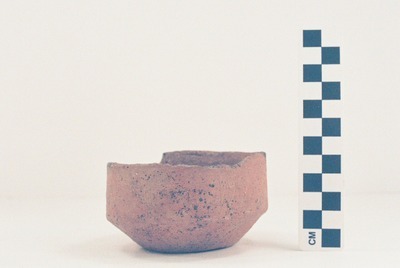 Cook carinated bowl from the R. L. Jowell Farm site.